Shawn's Bicycle Adventures: Concrete or asphalt? Last week, I biked the new multi-use path on Warden Avenue from Major Mackenzie to 16th Avenue in Markham, about 2km in length. It's a 3m wide concrete path plus a 1m wide strip between the path and the curb, providing ample space in the boulevard. Here's a project news release. There's currently no signage or pavement markings indicating that cyclists are welcome in the boulevard here. It looks like a wide sidewalk, particularly since it is concrete. 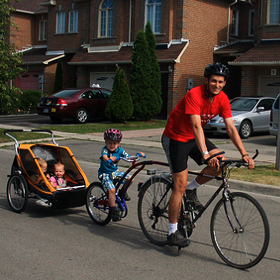 There's a debate in Markham about whether asphalt or concrete is a better surface for cycletracks and multi-use paths. I rode the asphalt path on Major Mackenzie from Angus Glen Community Centre, and then connected to the concrete MUP on Warden. I found the asphalt had a smoother ride (no joints to ride over). The condition of the asphalt path has held up nicely since it was build a few years ago, though concrete is expected to last longer. Here's a short video showing segments of both the asphalt (Major Mackenzie) and concrete (Warden). Sorry it's a bit shakey, my helmet cam wasn't on tight enough. 0 - 1:10 is Major Mackenzie, 1:10 - 2:08 is Warden. My verdict: I don't think concrete is worth the extra cost. If it is built properly, an asphalt path will serve the cyclists needs. I'd rather have more kilometres of usable paths. However, time will tell on the full life cycle costs and maintenance requirements. The paths on Warden and Major Mackenzie offer a good opportunity to study how the two different surfaces hold up over time.